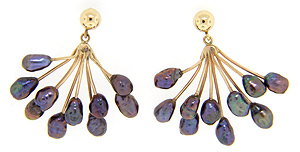 Designed by Marlene Harris, these 14K yellow gold earrings are decorated with black pearls which terminate 14K gold wires. Set on posts, the custom made earrings are a one of a kind look guaranteed to improve any jewelry collection. The earrings measure approximately 1 1/4” in height and 1 1/4” in width.